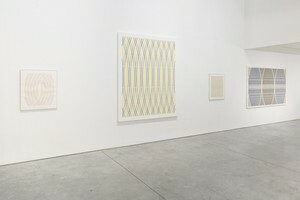 Richard Taittinger Gallery presents Transmitting Waves, a solo exhibition of paintings and studies by Nassos Daphnis. 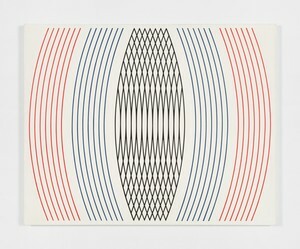 Transmitting Waves features works from the early 1960s to the 1980s. 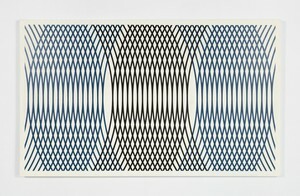 This show is a homage to and a reimagining of a 1983 show at the legendary Leo Castelli Gallery. 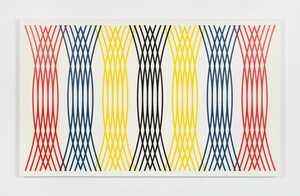 Castelli cultivated an impressive roster of artists including Jasper Johns, Robert Rauschenberg, Frank Stella, and Nassos Daphnis. 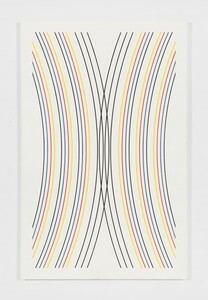 Daphnis was one of his his most shown artists with 17 solo shows. 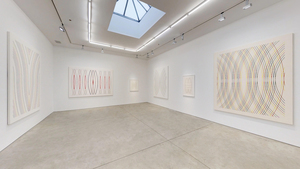 He was actively supported by Castelli for 38 years and his work has been placed in some of the most prestigious institutional collections including the Guggenheim, the Whitney and the MoMA. 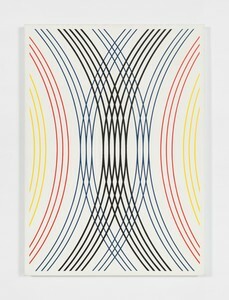 The Transmitting Waves artworks employ Daphnis’ distinctive use of primary colors and geometric shapes. 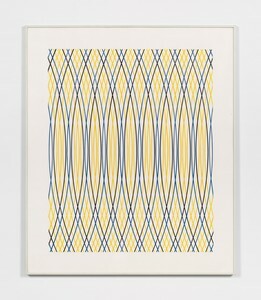 Inspired by an interest in invisible influences on the physical world, such as magnetic forces or radio waves, these pieces serve to both comment on transmission, and to transmit information and emotion themselves. Daphnis struggled to decide whether he was an artist or a scientist. 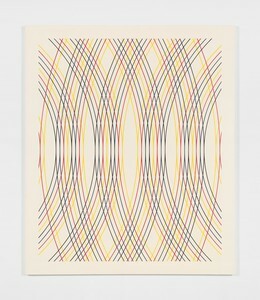 These works, which highlight Daphnis’ interest in science and mathematic precision, are comprised of systematic lines of primary colors radiating out from and towards each other, meeting, and crossing rhythmically. 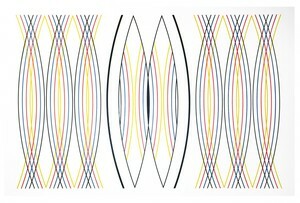 Daphnis’ Color-Plane Theory, developed in 1958, suggests that each primary color occupies a number of planes on a scale of 1 to 100. The primary colors themselves point to foundational blocks of communication; fundamental starting points. According to Daphnis, black was non-penetrable and occupied levels 0, the frontal plane, through 10. Spatially dominant, blue occupies planes 10 through 70. Red, which Daphnis thought of as planes in which everything is alive and growing occupies planes 20 to 50. Yellow exists in planes 60 through 90, which have less density. 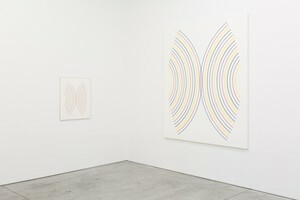 White, which is open and expansive, is situated in planes 90 to 100. 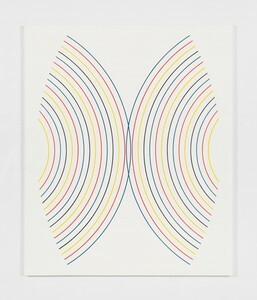 As the colors in the Transmitting Waves series spread and arc, the ideas and feelings they communicate expand. 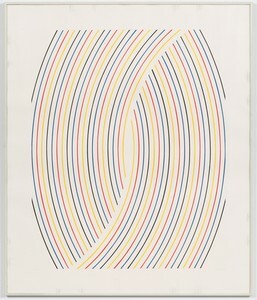 As the viewer follows the lines to the edges of the canvas, they are easily able to imagine them continuing and the patterns repeating infinitely. The entirety of information that could be transmitted cannot be contained in a single canvas. 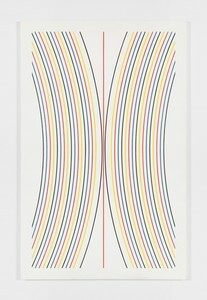 When the lines of color meet or cross, there is a sense of tension or impact. These fixed points of meeting read like employment of events in history. 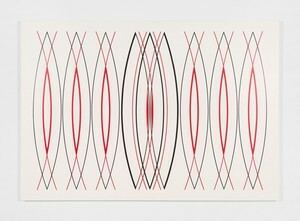 The rhythmic nature of the work allows them to shift and vary. 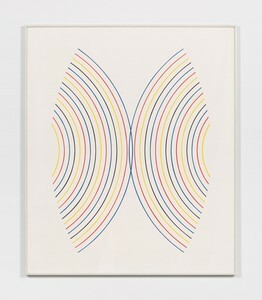 The works seem to oscillate and change in front of the viewers’ eyes. 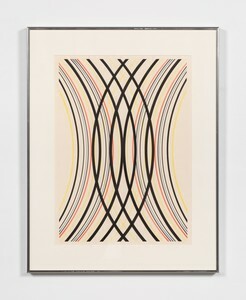 Although inspired by an earlier Castelli show in 1983, this show is an original exhibition, which includes previously unseen studies and early works on paper. 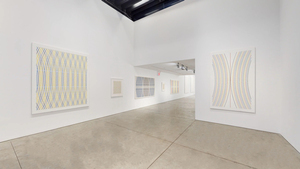 These extraordinary works dating back to the 1960s and 70s demonstrate the breadth of research, work, and thought that went into his later paintings. In the 1960s, he had not yet figured out a way to translate these smaller works into the large-scale canvases he would eventually make. Precision and exactitude were essential for Daphnis. 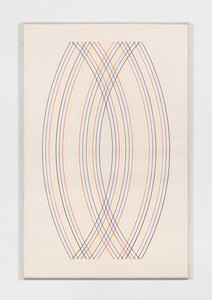 The crispness and even spacing that we see in his early works including 15-68 and studies such as S-6-82 are also apparent in his large-scale works such as H-9-83. Remarkably, Daphnis worked without a studio assistant. His dedication to his work is evident in these vibrant pieces. Throughout this series Daphnis’ disciplined and rigorous methods are unmistakable. 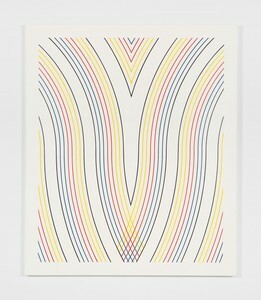 His lines are presented with meticulousness and a sharpness that is typical of his work and hard edge style. 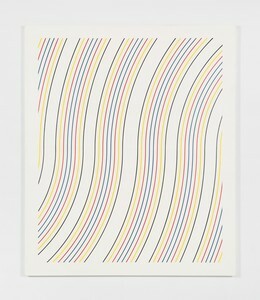 The lines in Transmitting Waves are thinner and feel more elastic than some of his earlier work characterized by thick lines saturated with color. 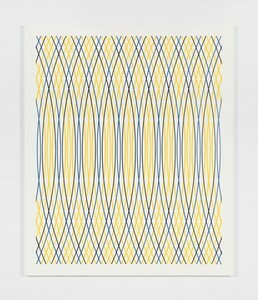 Daphnis’ explorations of geometric shapes and color allow him to push boundaries and limits while working systematically and deliberately. Transmitting Waves echoes the explorations and preoccupations of Daphnis’ earlier works, but its comparative lightness and elasticity make it particularly relevant and exciting today. 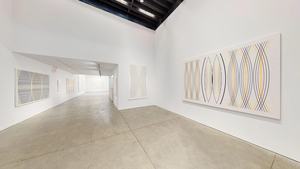 Showing the Transmitting Waves series at Richard Taittinger Gallery 35 years after the original show is a means of paying tribute not only to Daphnis’ work but also to his enduring legacy in the New York art scene. Transmitting Waves will remain on view through November 10th, 2018.